Green Eggs and Ham by Dr. Seuss is a level J according to the Fountas and Pinnell reading level scale. Green Eggs and Ham is a book about a guy named Sam and he is trying to get his "friend" to try green eggs and ham. However, his friend does NOT want to try green eggs and ham, until finally he actually tries them and likes them. 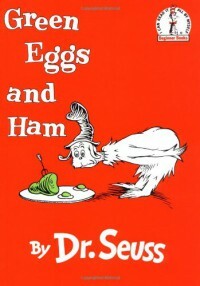 I think Green Eggs and Ham is a great book for Dr. Seuss week, and you can make your students try green eggs and ham. You can even have it as your class data that day on if your students liked green eggs and ham, if they never tried green eggs and ham, or if they did not like green eggs and ham.